This is a new edition of the author's memories of his time in East Africa, revised mainly by the addition of a new final section on developments in the wildlife field since he retired from the post of Chief Game Warden of Tanganyika in 1964. The addition balances an introductory succinct history of game conservation in East Africa. The filling within this casing is an account of Bruce Kinloch's dedicated work to promote wildlife conservation and management, mainly in Uganda, spiced with some rattling good yarns of brushes with those four menaces - the shamba-raiding elephant, the wounded buffalo, the ivory poacher and the bureaucrat. When, after 'a good war', the author was selected for the Colonial Administrative Service, the hunter/naturalist tradition in his family cut him out for appointment to Kenya. However his first posting to Kilifi brought him into rapid contact with the African elephant whose fascination shaped the rest of Kinloch's career. He soon transferred to the Uganda Game Department, shortly thereafter succeeding Captain C. R. S. Pitman as its head. Thus he came to know a number of the fabulous old East Africa hands whom he described with affection. It also faced him with the daunting task of formulating an effective policy for protecting farmers from game destruction and game from unauthorised hunters, and securing its acceptance and the resources for carrying it into effect, before the prospect of attracting tourists loosened official purse-strings. I was glad to read that he received powerful support from at least some administrators, notably Barrie Cartland in Entebbe and an unnamed allocator in Dar-es-Salaam of sites and buildings in Tanganyika, as well as Sir Andrew Cohen. Having been intimately concerned with the setting up of Uganda's national parks Kinloch's discussion of the relationship between parks administrations and national game departments must be an important contribution to the subject. 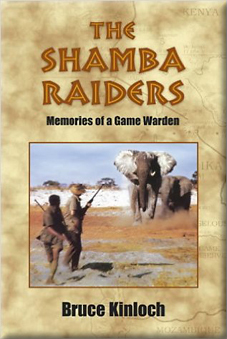 The author's time as Chief Game Warden of Tanganyika was curtailed by localisation. But during this period he was the force behind the setting up of the College of African Wildlife Management whose value was proved by attracting students from the rest of English-speaking Africa and indeed beyond, when East Africa's fissiparous tendencies undercut its regional base. My recollection of this, in which I played a minor part, confirms the author's setting of the record straight on this achievement in which he takes a justified pride. The last section gives some grounds for hope that, with one important exception, the Horatian dictum holds good and that nature even when driven out by a pitchfork (or Idi Amin's army) can be relied on to find a way back. But, alas, exploding human populations covering the land with static cultivation form the exception, at least for large mammals. This readable book, well illustrated in appropriate places by the author's own fine photographs and a friend's attractive line drawings would make a good birthday present for someone with an interest in wildlife or who enjoys the rich flavour of colonial East Africa.